This is an easy, basic lima bean recipe with ham, onion, and seasonings. Even if you aren't a fan of lima beans, you're sure to like this dish. Dried lima beans, also known as butter beans, become tender and creamy when cooked, and they're much better tasting than canned. Besides, 1 pound of dried beans makes as much as about three to four (15-ounce) cans. So they also are much easier on the budget. Some people have trouble with beans in the slow cooker, so salty seasonings are added after the beans become tender. 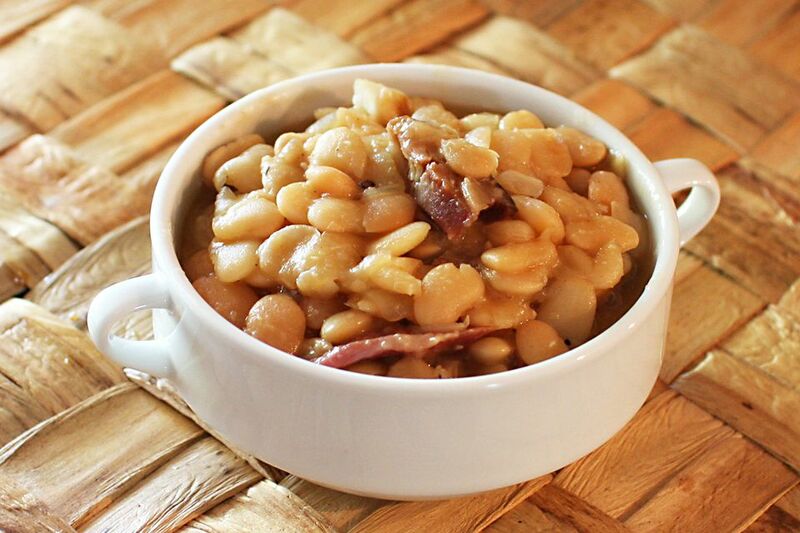 If you routinely cook beans with salt and have no trouble, go ahead and add all ingredients to the pot. For a true Southern meal, serve the lima beans with freshly baked cornbread (preferably unsweetened) along with a tossed salad or cooked greens. Macaroni and cheese, potatoes, and corn also go well with these lima beans. The lima beans must be soaked overnight so plan accordingly. Soak the lima beans in about 2 quarts of water overnight. Drain and put lima beans in the slow-cooker insert. Stir in the chopped onions and add the ham bone. Add 3 to 4 cups of fresh water just to cover the beans. Cover and cook the beans on HIGH for 2 1/2 to 3 hours, or until the lima beans are tender. Add any extra diced ham, the Cajun or Creole seasoning and black and cayenne peppers. Taste and add salt, as needed. Cover and cook on LOW for 4 hours, or until the beans are very tender. Note: Instead of a ham bone, use ham hocks or smoked pork shanks or add salt pork or bacon.